Set at the heart of Jalan Hayam Wuruk on the top floors of the Lindeteves Trade Center (LTC) in Glodok the hotel is surrounded by an abundance of shopping malls, some of the city’s best restaurants and North Jakarta's famous nightlife venues. Jakarta’s Soekarno - Hatta International airport can be reached in about 35 minutes while other major points of interest including the Presidential Palace, the National Monument (Monas), the Ancol Dream Land Park, Mangga Dua Square, Old Batavia’s Heritage district and the Jakarta Fair Ground are a mere minutes away. Poised as an international standard 2-star following its award-winning standards for leading budget hotels, the 203-room “fave” offers stylish, modern guest rooms, many of which enjoy views of Jakarta's glittering skyline. Each room is super-clean and equipped with top of the line beds and cotton linen, complete with LED TVs, high-speed WiFi and complimentary bathroom amenities. The lounge and bar facilities and the all-day Lime café-shop makes the hotel ideal for leisurely travelers, while the several functional meetings rooms provide a sophisticated space for business and conference needs. Soft Opening favehotel LTC Glodok - Jakarta, seen in the picture from left to right Mr. Waluyo Susanto, Mr. F.X. Donny, . Mr. Robby Silfanus, Mr. Arif Prijatna, Mrs. Tannya Wirasmo, Mr. Jules Brookfield, Mr. Ariesman Widjaja, Mr. Johnson Putra Lawadinata, Mr. Herman Tambayong and Mr. Johan Gito during the Soft Opening Ceremony. 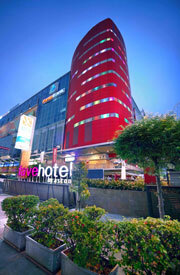 Exterior of favehotel LTC Glodok – Jakarta. favehotels currently operates 20 hotels throughout Indonesia and Malaysia out of which 7 are in Jakarta and 5 in Bali and has a development pipeline of more than 40 hotels in Indonesia, Malaysia and the Philippines.